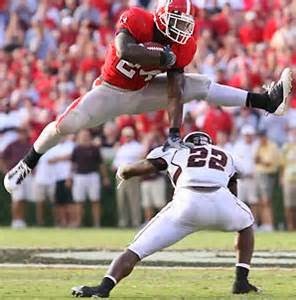 A Collegiate Knowshon Moreno in two eligible years (2007/08) as a Georgia Bulldog had 498 carries for 2,734 yards with 30 Touchdowns, and 53 receptions for 645 yards with three touchdowns versus the dominant SEC. 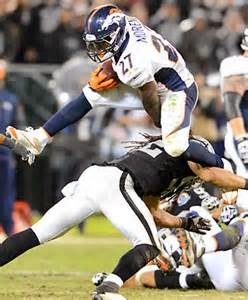 NFL draft combine Moreno is a 5-11, 220 pound, first round, 12th overall 2009 draft pick that excels in the NFL's rushing, receiving , and blocking game. 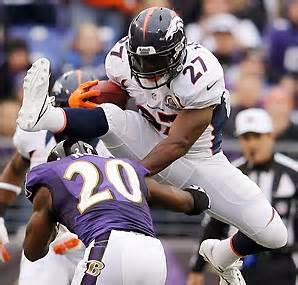 During Knowshon Moreno's first two Denver Bronco seasons (2009/10) he tabulated 1726 yards rushing, 585 receiving and 17 total touchdowns. In 2011 Moreno suffered an unfortunate ACL injury that severely minimized the opportunities at such previous successes. He missed the majorities of the 2011, and 2012 seasons though he did accrue 525 yards rushing with four touchdowns over the later half of 2012. A healthy 2013 Moreno (26) had his most productive year to this point of his career with 241 carries for 1038 yards rushing, ten touchdowns along with SIXTY RECEPTIONS for 548 yards and three more touchdowns. Not since the Good-Ole horse and buggy days of the 1900's (99 to be exact), have these somewhat similar lyrics been redundantly sung throughout a Miami Dolphins game broadcast. 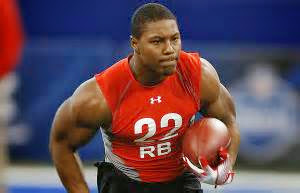 WELCOME to Miami Knowshon Moreno! Thank You for an Open Minded Read, and we look forward to your angle of view!! !